Edge painting/ colouring and foiling well and truly takes your business card to the next level – showcasing your dedication to attention to detail. A sophisticated finishing method, this feature to your business card changes its complete look and feel drastically and dramatically. Play on your brand’s colours and incorporate it sleekly and stylishly to the edges of your business card in our premium selection of Pantone or Foil shades. Edge colouring and foiling promises to deliver a product that is effortlessly luxe and lavish. This finish involves foiling or ink being delicately applied along the edges of the card to give it a remarkable and unmissable finish. 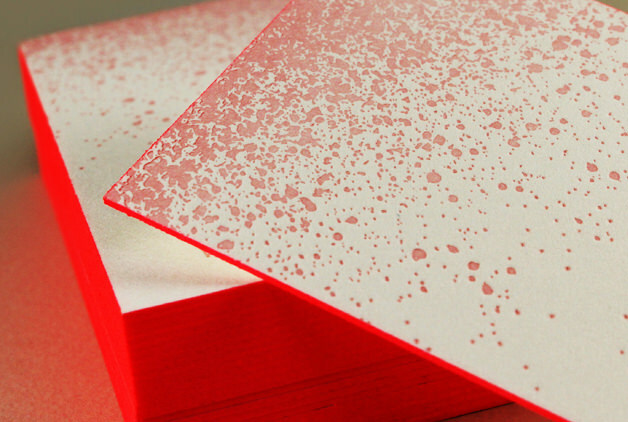 Inktank recommend the heavier the paper, the better result so we personally suggest 600GSM stock and above is the way to go, although 300 GSM and above is possible. 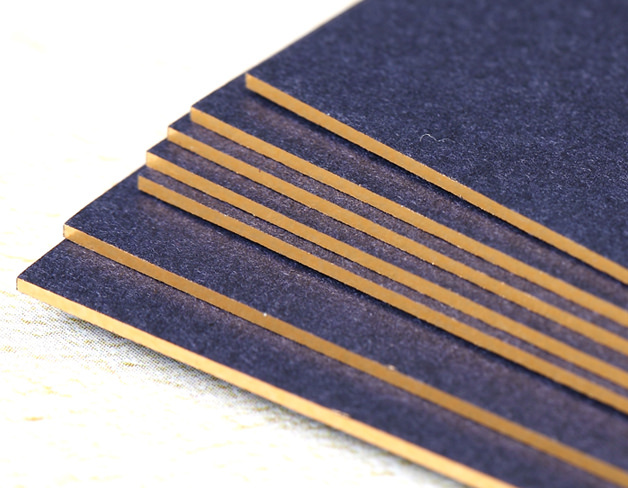 This process works beautifully with duplex options as it will hide the joint where the edges of the papers are bonded. We pride ourselves on using the thickest and most luxurious 100% cotton-blended specially imported from Germany and offer options up to 1000 GSM for super thick, extra lush presentation. Also referred to as gilded edging, InkTank offers gold (matte and gloss options) as well as gloss silver foil colours. Contact our staff for additional foil colours. Edge colouring is available in a full spectrum of Pantone colour options. When ordering, please specify your preferred colour in Pantone PMS code and we will do our very best to match this colour. The cost of the edge colouring is determined by the difference in the shade of the paper in comparison to the foil edge colour. If the colour of the paper is darker than the desired edging colour, the cost is slightly higher as additional processes are required to achieve the optimum result. The touch of coloured or foiled edging gives your card that exceptionally lustrous and luxurious appeal, especially if you pair a foil design with an additional foil edge look! To save costs, speak with our staff today for pre-foiled cards that we currently stock or order a sample of our paper stocks online today!